The following series of articles, all reprinted from Tuggers, highlight unique and interesting aspects of the Victory Tug as observed by its owners. In April, aboard Marty Raymond's and Jay Sterling's Cruz-In #74, I saw core samples of their salon and pilothouse roofs. These cores go a long way in explaining how these surfaces were laid up. We already know that a single mold was used to form the inner bulwark, deck, cabin side, and roof. The core samples (see photo) are 1-1/8" thick and composed of (1) a layer of gel coat, (2) 3/8" of fiberglass, (3) 9/16" of 7-ply plywood, and (4) another 3/16" of fiberglass. Tommy Chen, whose yards built our tugs, told me that the plywood in the ceilings is broken into squares and that each square is separated from its adjoining squares by a waterproof material. This is clearly visible in the core samples as each has a 1-1/4" wide channel, of what appears to be polyester filler, separating the plywood pieces. The reason for including the polyester separator is two fold: it makes the decks stiffer i.e. feel more solid underfoot; and should any water find it's way into a wood square, via a leaking screw hole for example, the water will be contained within that square. Knowing how these surfaces are made informs how we can safely attach things to them. If a mounting screw is 5/16" or less then water could never get into the core via the screw hole. If the penetration is greater than 5/16", the fasteners should be bedded to prevent water getting into the core. Finally, limiting a fastener's penetration to 1" or less will keep the fastener from penetrating the lower layer of fiberglass and into the space above the headliner. In summary, the salon and pilothouse ceilings are a plywood checkerboard sandwiched between layers of fiberglass. Each square of the checkerboard is isolated from its adjoining squares by a waterproof material. A little forethought before screwing into these structures will keep the roofs robust for a long time. A foredeck core sample of Cruz-In #74 reveals some interesting details about how our boats were built (see photo). The top of the core sample consists of three 7/16" thick teak planks. Each plank is 1-13/16" wide and separated from its neighbor by a 3/16" wide bead of polysulfide caulk. The caulk sits in a groove that's only 3/16" deep. Which means that under the caulk, each teak plank butts up against its neighboring teak planks. The teak plank is bedded to the underlying gel coat with a thin layer of polysulfide. Under the gel coat is a 1/4" of fiberglass. Under the fiberglass, and this was news to me, is 3/4" of softwood coring installed in an end-grain manner. In August 2013 I asked Tommy if he used balsa in our tugs. He said yes but then added, with a wink and a smile, that it was "Taiwanese balsa". 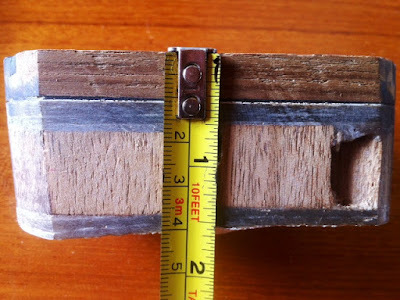 Each piece of wood core is about 2" x 2" and separated from its neighbor by 1/4". That 1/4" space is filled with a waterproof sealant, most likely a thickened polyester. Under the wood core is a 3/16" thick layer of fiberglass. Finally, under the fiberglass, is a layer of gel coat. From the robustness of the core sample it's clear that handling the high windlass loads was a major factor in the foredeck's design. My guess is that the coring stops at the chain-locker bulkhead and then from there aft it's a solid fiberglass deck. 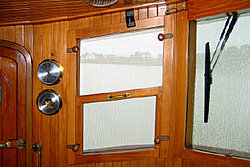 At Seattle's 2006 LNVT Rendezvous, Tommy Chen and Loren Hart described some of the difficulties in finishing a boat's interior. 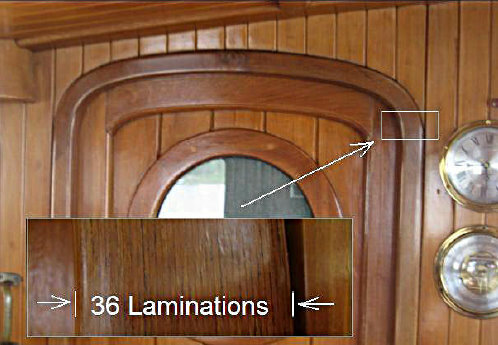 Specifically they mentioned a curved, teak, trim piece on the Lord Nelson 41' sailboat that ran the salon's length, see LN 41 photo. The piece's length meant it had to be machined off the boat and then iteratively fit and adjusted. Did Tommy face similar challenges on his tugs? In fact he did. The valance, which runs the length of the salon, is made from a single teak board which conforms to the cabin-top's curvaceous line. Another example is the rail mold on the starboard side, see LNVT 37 photo. Doing these elements as a single piece is a statement of quality and speaks to the competence of the woodworkers. Reprinted from Tuggers, Summer 2010, Vol. 44.
it was there you'd miss it completely. Only the telltale hinges give the door away. Speaking of the hinges, they were originally engineered to support the weight of a coat closet. But many tugs have converted this space to a pantry, a much heavier load, yet still the hinges hold up. 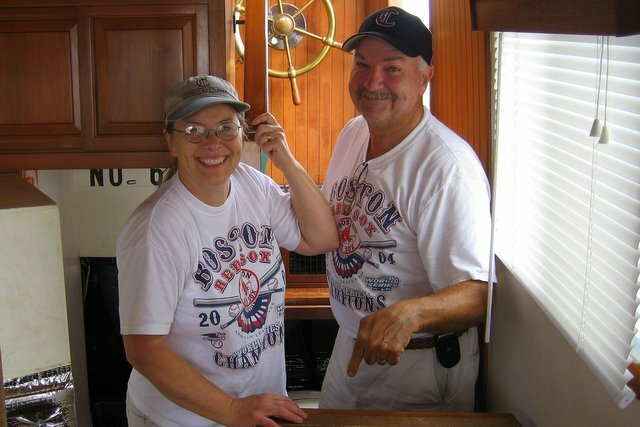 Renee and Ward Dunning, LADY HAMILTON #12, who are standing in front of the open Tommie door, are laughing because they just discovered that the salon's steps to the pilothouse are removable. With the Tommie door open and the steps removed, a third of the engine room is open to the salon. There isn't another trawler our size that has this kind of engine room access. Reprinted from Tuggers, Spring 2010, Vol. 43. Have you ever looked closely at the steps in your LNVT? 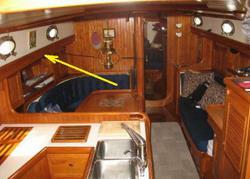 I'm talking about the four steps into the stateroom, the four up to the pilothouse, and the one in the companionway. The vertical pieces, or risers are made of solid teak and are paneled to match the salon's wainscoting. The horizontal pieces, or treads are also made of solid teak, are slightly under 1" thick, and sport a 5/16" radius on the bull-nosed leading edge. An easily overlooked design detail is the slight, 3/8" curve or bow in the tread's leading edge. It's hardly noticeable but it says a lot about the thought, pride, and care which went into each of our tugs. From a cost perspective, the curve more than doubled the time it took the carpenter to make the tread. Functionally, having the tread just a little wider in the center makes the step more comfortable. Bottom line, the curve is a winner both aesthetically and ergonomically. Reprinted from Tuggers, Winter 2010, Vol. 42. The way the 37’ pilothouses' forward windows open certainly sets LNVTs apart and, like the bitt and Dutch door, is integral to the concept of a 'tug'. Loren Hart sure thought so and made the opening window an early design priority. How to actually do it however was not so clear. Jim Backus' blueprints show the window hinged at the top. Before or during the construction of the first hull, however, someone realized that there was enough room for the window to drop down. On the first two hulls all five front windows drop down while from hull #3 on, only the two most aft windows do. One of the things that strikes you when looking at several LNVTs together is that the spacing between each tug's windows is very different. This is probably because when the pilothouse came out of the mold there was nothing but solid fiberglass where the windows should be. Since the windows were not molded-in, but rather the fiberglass was cut out, each window's location is unique. Some primary concerns with a drop down window are waterproofing and draining the well. 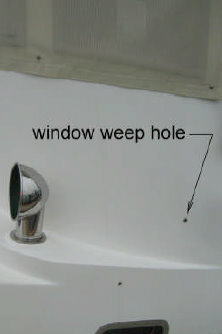 The LNVT's well is waterproofed with fiberglass and as the picture shows drains directly outside through a weep hole (the other weep hole in the picture is for the dorade). The best evidence for the suitability of the design is how trouble free it is. From a functional standpoint, being able to open the window from a little to a lot is invaluable. For instance, on a hot, rainy, day the window can be lowered just a little to let air in while the overhanging eyebrow will keep the rain out. On a hot day, with the window fully dropped a lot more air gets in than via the Dutch doors alone. From both a design and functional standpoint the drop down windows are a winner. What's priceless though is how they make you feel when, as a cooling wind blows through them, you wave hello to a passing cruiser. Reprinted from Tuggers, Fall 2009, Vol. 41. This photo of the bulwark cross section gives some insight into how our LNVTs were put together. The inner bulwark, on the right hand side of the photo, was formed in a mold—probably the same mold as the deck and cabin. The fiberglass is 5/16" thick with a layer of white gel coat on the outside. Before the teak cap was fitted a leveling filler (the white triangular shape) was applied. The under side of the teak cap was rabbited (i.e. a grove was cut along its length) so that it would sit like a bottle cap over the bulwark. To keep water from penetrating into the bulwark a sealant, very much like poly sulfide, was spread under the entire cap. Even after 22 years the sealant is pliable and adhering well. At some point during the LNVT production run the decision was made to fill the bulwarks' cavity with foam; the idea being to make the tugs unsinkable. The outer bulwark was made in a mold, is 1/2" thick, and has a green pigmented gel coat on the outside. Reprinted from Tuggers, Summer 2009, Vol. 40. Wood joinery, the art of joining two pieces of wood, is often a compromise between strength and beauty. 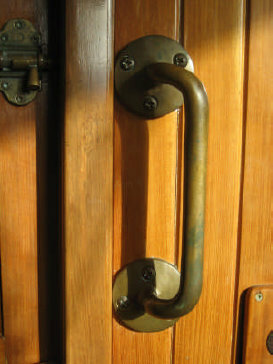 But, in the six mortise and tenon joints holding a Victory Tug's exterior doors together, strength and beauty merge. Tenons are easy to spot. They're the dark, rectangular penetrations on the door's vertical edge. Since the tenon's penetration goes all the way through the door's stile, this joint is called a through-mortise and tenon. Used since antiquity it has a proven track record, however, it's time consuming to make as each piece must be cut and handfit. Modern glues make this joint virtually indestructible. 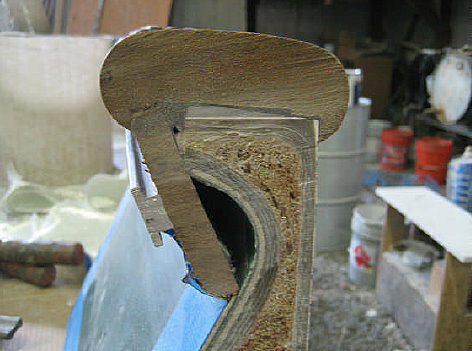 In a 'hat tip' to the past, the through-mortise and tenon joint will only be found on the best made boats. Reprinted from Tuggers, Spring 2009, Vol. 39. Our salty, bronze handholds are easily overlooked even though they're strategically located in the pilothouse and salon. According to Loren Hart, the handhold's provenance is from an 1840's Scottish schooner. While touring the ship he admired the handhold and although not knowing where he could possibly use it decided to procure one none the less. Years later with LNVT about to go into production Loren remembered the Scottish handhold and gave it to Tommy Chen. The rest, as they say, is history. Except for minor modifications in late 1983 or early 1984, when the flange's diameter was increased and the handhold's length decreased, the same handhold was used throughout the Victory Tug's production run. Reprinted from Tuggers, Winter 2009, Vol. 38. Love your teak interior? Tommy Chen, LNVT builder, said that each boats' teak came from a single, roughly 6' diameter log. 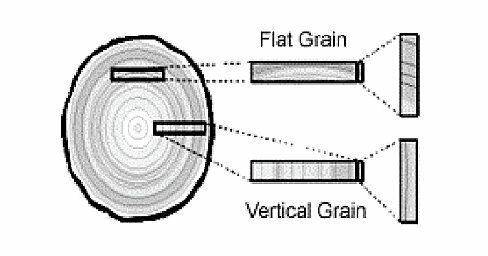 The log was quartersawn, which is more expensive than plain sawing, so that each board has a vertical grain, consistent color, and is not likely to warp, cup or shrink. Ken and Pat Smith, POLAR MIST (49) #7, who recently (2008) bought some vertical grained teak for a new cabinet, report paying $85/board-foot. 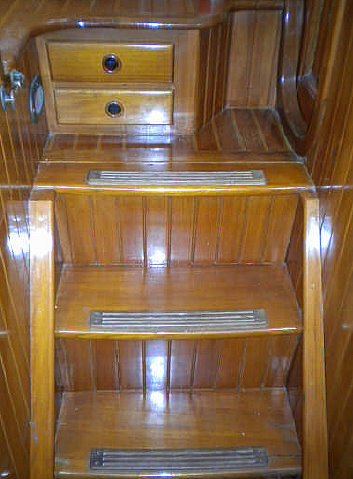 The high cost of teak was one of the reasons cited at the 2006 Rendezvous by Loren Hart, owner of Lord Nelson Yachts, why it would cost $400,000 to build an LNVT in 2006 dollars. Reprinted from Tuggers, Fall 2009, Vol. 37. Loren Hart, founder of Lord Nelson Yachts, said that wood wrights were the most important part of his business. 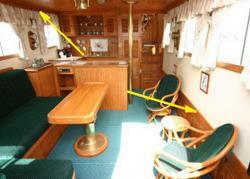 I was admiring their joinery in the pilothouse the other day while trying to figure out how they did it. While it's hard enough to make good joints, curved surfaces take the art to a whole new level. My eye was drawn to the Dutch door's 1-1/4" jam. Here the wood is beautifully joined and curved. Additionally, it must survive the ravages of weather. Close inspection of the curved areas shows that they're made not of one piece of wood but rather 36 individual pieces glued together. These bentwood laminations are only 1/32" thick. The glue-up and clamping is very time consuming and labor intensive. This little detail speaks volumes of the care taken in building our boats. Reprinted from Tuggers, Summer 2008, Vol. 36.